Continuing its strong commitment to open-source and to the OpenNebula community, C12G Labs has just announced the open-source release of OpenNebulaApps, a suite of tools for users and administrators of OpenNebula clouds to simplify and optimize multi-tiered application management. The new software has been released under Apache license and will be incorporated into the main distribution of OpenNebula. After the announcement made two weeks ago about the public distribution of OpenNebula Maintenance Updates and Service Packs, the incorporation of this innovative functionality consolidates OpenNebula’s position as the most advanced, enterprise-ready open-source cloud management platform. AppMarket to build a centralized and private catalog of cloud applications to share and distribute virtual appliances across different OpenNebula instances. This new enterprise functionality, along with the existing production-ready processes for software release, Q&A and upgrade, and the availability of several support options directly from developers, reduces cost and complexity of building and operating OpenNebula clouds and ensures its long term stability and performance. We’re happy to announce that OpenNebula will participate in the next edition of FOSDEM ’13 which will be celebrated the 2 & 3 February 2013. Getting Started Hacking on OpenNebula. 11:00-11:30 3rd Feb. Cloud devroom. Enabling cloud for e-Science with OpenNebula. 11:30-12:00 3rd Feb. Cloud devroom. BuildSys and QA in CentOS using a Private Cloud: OpenNebula. 12:00-12:30 3rd Feb. Cross distro devroom. Raindrops. 13:00-13:30 3rd Feb. Cross distro devroom. We will be very happy to see you there! 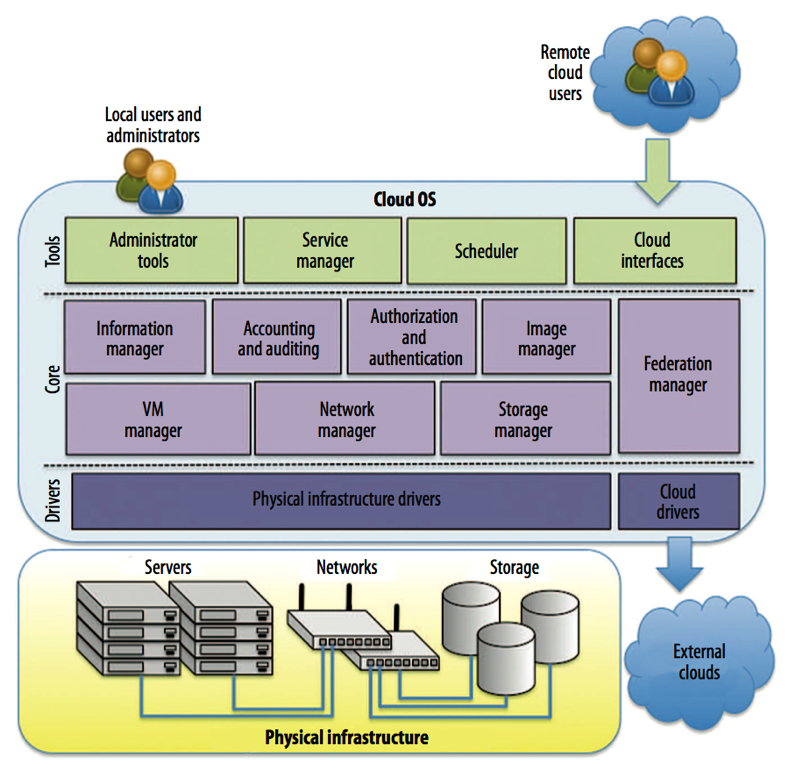 The December 2012 issue of the IEEE Computer Magazine includes an article entitled “IaaS Cloud Architecture: From Virtualized Datacenters to Federated Cloud Infrastructures” that presents an architecture reference model for IaaS clouds, introduces the cloud OS (Operating System) as the core component of this architecture, and discusses the different approaches for cloud federation. The article mentions OpenNebula as an open-source reference implementation of the cloud OS platform that is responsible for managing the physical and virtual infrastructure, orchestrating and commanding service provisioning and deployment, and providing federation capabilities for accessing and deploying virtual resources in remote cloud infrastructures. Continuing its strong commitment to open-source and to the OpenNebula community, C12G has just announced that every OpenNebula Maintenance Release and Service Pack will be made publicly available at the community site. From release 3.8, the OpenNebula community will enjoy the benefits of the OpenNebulaPro distribution including the C12G’s Quality Assurance processes. Community users will now have access to a more frequently updated, certified enterprise-ready software distribution. The OpenNebula community will have access to regular Maintenance Releases with fixes and minor enhancements; as well as to Service Packs that will extend the life of each OpenNebula series for up to three years. Commercial support subscribers will receive production level support for OpenNebula without having to wait for an additional certification process. All of the many benefits of C12G’s commercial support subscriptions will apply for OpenNebula cloud deployments. Also any community installation of OpenNebula can enter a support program without installing a new version of OpenNebula. This new Release Strategy and Q&A Process, together with the existing Upgrade Process for production environments and the availability of several support options directly from developers, will reduce cost and complexity of your OpenNebula cloud and ensure its long term stability and performance. Community Support for developers, researchers and technical enthusiasts to test and evaluate the capabilities of the software, and to build pre-production cloud environments. Basic Support for corporations, research centers and governments that require expert support assistance with basic SLAs during customization and building phases or to operate non-production cloud environments for testing/development applications. The annual subscription rate for the basic support is a flat fee of 750 euros for unlimited servers. Production Support for corporations, research centers and governments that require expert support assistance with production SLAs to operate cloud environments for production applications. The annual subscription rate for the production support varies with the level of service and the size of the cloud starting at 320 euros per server. Basic and Production Support options are commercial support subscriptions that help sustain the OpenNebula project. Besides the long-term commercial support, utterly important to medium and large organizations, commercial support subscriptions bring additional benefits in terms of software, like access to the OpenNebulaApps suite or influence on the OpenNebula roadmap; documentation, with access to the PDF version of the guides and discounts in training; and legal protection. Happy New Year, everyone! This is our first newsletter of 2013, summarizing everything that happened during the last month of 2012. In case you haven’t read it yet, remember we’ve also published a Year in Review post with all the exciting stuff that happened in the OpenNebula project and its community during 2012. The Team is focused on the upcoming 4.0 release. An important number of bugs are being wrinkled out, and several and relevant features are being worked upon. You can follow the progress from the development portal. The Sunstone facelift is advancing steadily, with usability being greatly improved. For instance, cluster management is going to be revamped completely, with the ability to create or update cluster with the appropriate resources, instead of adding them later. Also, CSS layout is being worked upon to achieve a cleaner interface. Changes are also going on with the command line interface, with a better interface and help. Other aspects are also being considered, like core enhancement with audit trails, additions to virtual machine lifecycles (like the “hold” state). Another important feature that will be introduced in the upcoming 4.0 release is the ability to create disk snapshots, which comes in very handy for the day to day service management. Other number of improvements are on the oven, like the ability to handle RBD block devices. The mechanisms offered to try out OpenNebula has been extended. Besides the existing Sanboxes with OpenNebula 3.8 preinstalled (for VirtualBox, KVM and VMware ESX), there is a new, even easier to try out Sandbox available within Amazon EC2. With it, users are able to log into the OpenNebula cloud, monitor the managed resources, and launch instances of virtual machines without the hassle of configuring a physical infrastructure. Also, an effort was carried out to develop simple how-to guides describing the step-by-step process to deploy OpenNebula in the most common linux and hypervisor combinations. Currently there are guides for CentOS and VMware, and for CentOS and KVM. Another great contribution has been added to the OpenNebula ecosystem, again by the hand of China Mobile. In this case, a new set of drivers are available to support Linux Containers (LXC). This work has been done in the context of the Big Cloud Elastic Computing System, engined by OpenNebula. As always, the OpenNebula community keeps an state of vibrant contributions. For instance, Robert Schweikert contributed a new init functionality, with the ability to bootstrap the OpenNebula database without starting the “oned” daemon. Moreover, a patch has been contributed by Simon Boulet to instantiate an existing template while providing custom attributes such as the CONTEXT or IMAGE_ID, without the need to Clone / create a user template. Another patch was also contributed by Simon boulet to create Vms on hold. Also, we would like to thank the numerous people that provided feedback, either through the development portal or the user mailing list, with bug reporting, patches for bug fixing and the intense testing. Two big thumbs up to the OpenNebula community! We want to highlight a very special mention of OpenNebula by Neelie Kroes, VP of the European Commission and Comissioner for Digital Agenda, during a talk about how the EU is supporting Open ICT systems, namely open-source, open-procurement, and open-data.